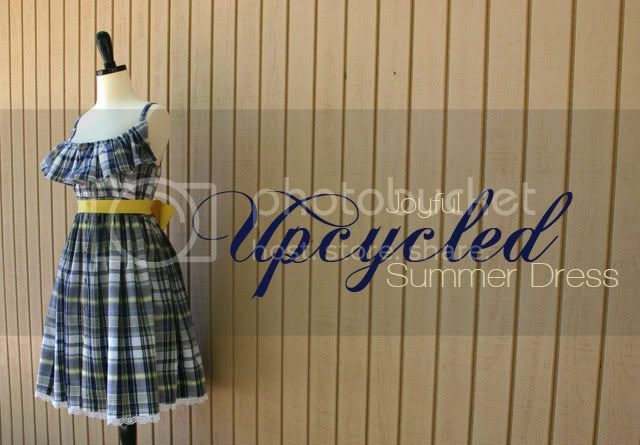 A couple of weeks ago I showed you one of my first upcycled dress for this summer. 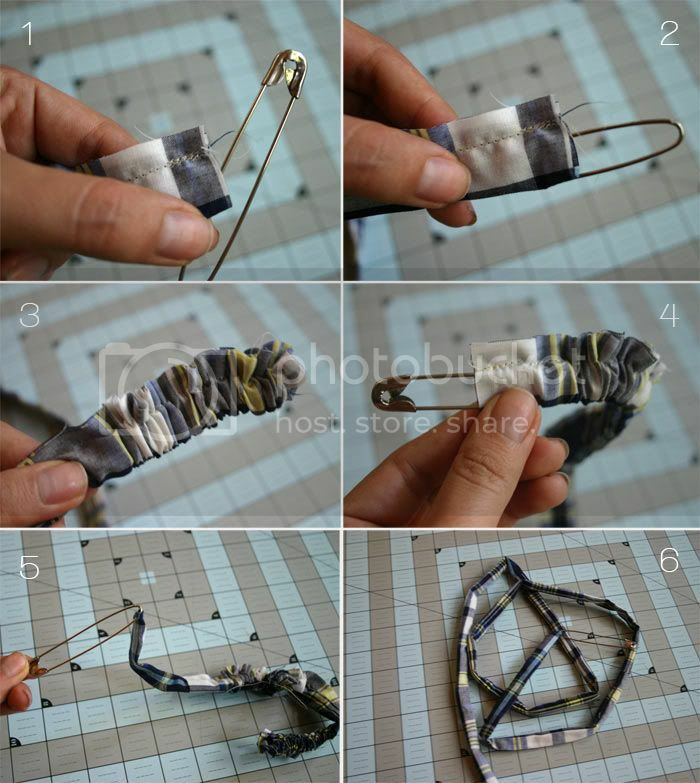 Well, I thought I should share the tutorial in case any of you would like to make one for yourself! I know finding a 6x t-shirt is not an easy task (I got mine at my local a thrift store for $2.00) but if you happen to find one, here is how I transform mine into this cute dress. I un-sew the front pockets (you can always sew them back to your dress if you want), cut the body of the shirt and the sleeves. 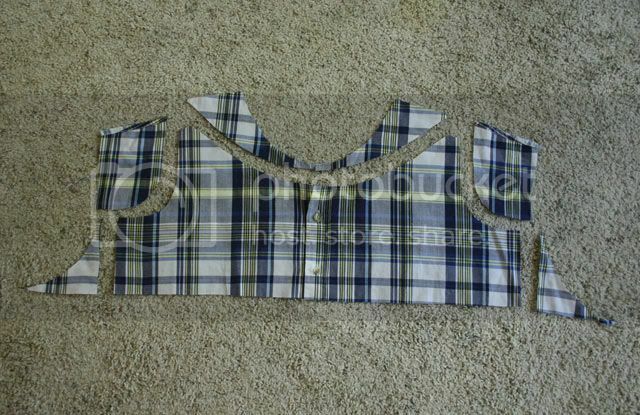 C- Cut the front of the shirt like shown in the picture, I made sure to measure my bust from under my arm to the other side and use that measurement for the width of this piece to fit me better. E- To make the straps for the dress, fold the 2inch stripes in half and sew along the edge, to turn them inside out I always use a big safety pin. secure the end of your strap with the safety pin. turn the front to the inside of your strap. pull through the inside of your strap. reach the other side and pull the safety pin out. keep until all you turned the whole strap. strap ready, just press to finish. F- Out of the back piece I named “waist stripes”, cut 2 pieces of 3inches wide each and half the length of your waist measurement + 3 inches, (in the second image) to have an even pattern in the front I cut one of those strips in half and added to the end en begging of the other one, the 3 pieces together must be your waist measurement. 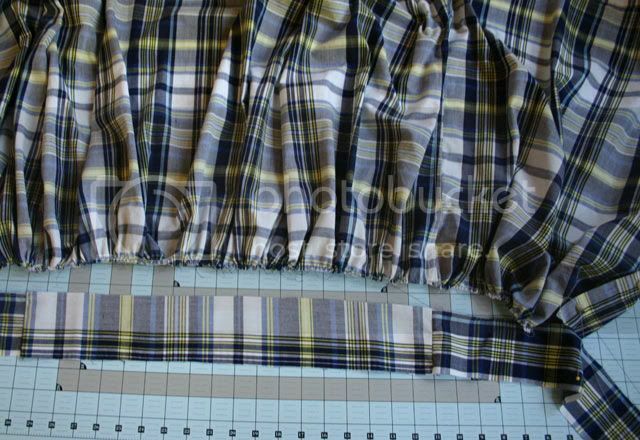 Put pins to mark you the bust measurement on the final stripe, leaving an extra inch for comfort. 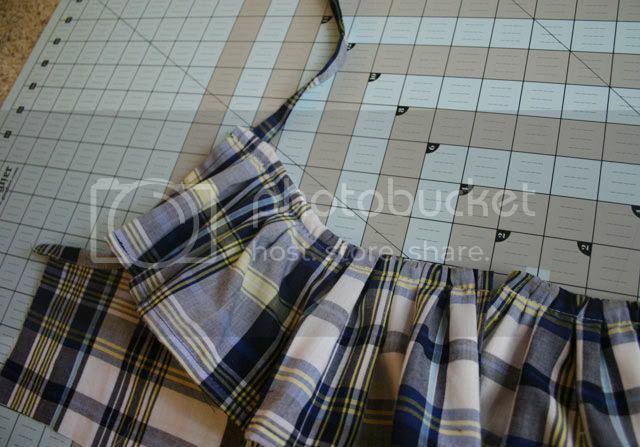 G- Ruffle the bottom of your dress, by sewing with the widest stitch your machine has and then pulling on one of the ends of the threat, center your waist stripe and make sure the ruffles are the same width as the measurement under your bust marked in the waist stripe. 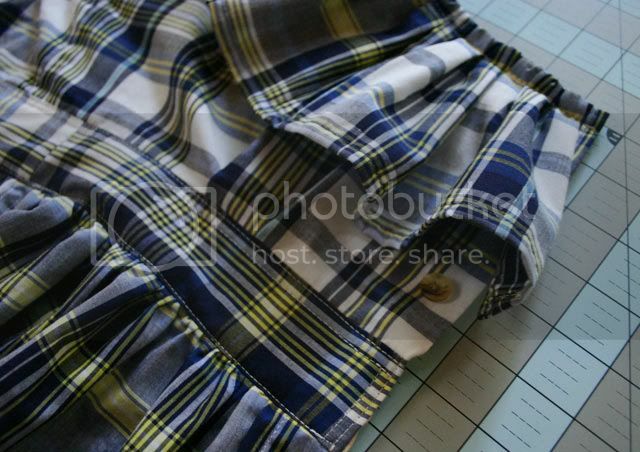 H- Pin to secure the ruffles, remember right side of the fabrics had to be facing each other. 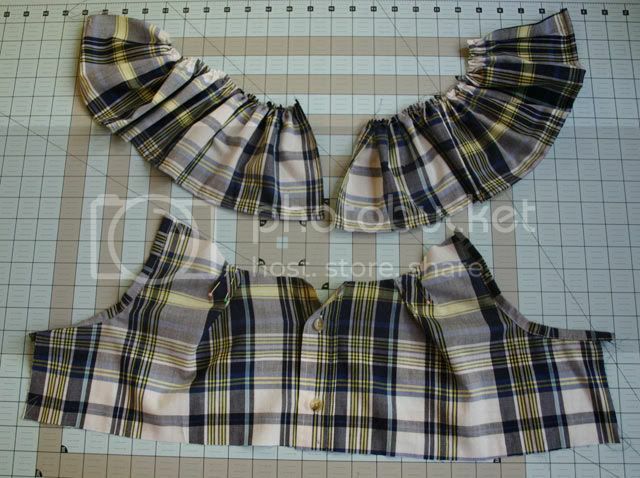 Grab the other piece you made and place it on top of the ruffles, with the wrong side facing out. 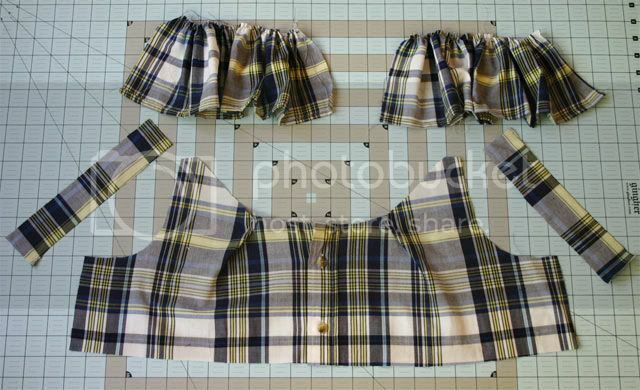 I – Sew the sandwich made out of the 2 waist pieces with the ruffles in between. 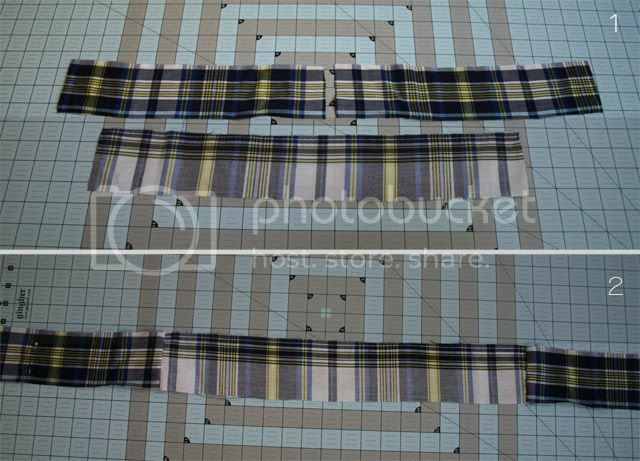 J- Turn the fabrics up and this is how it should look. 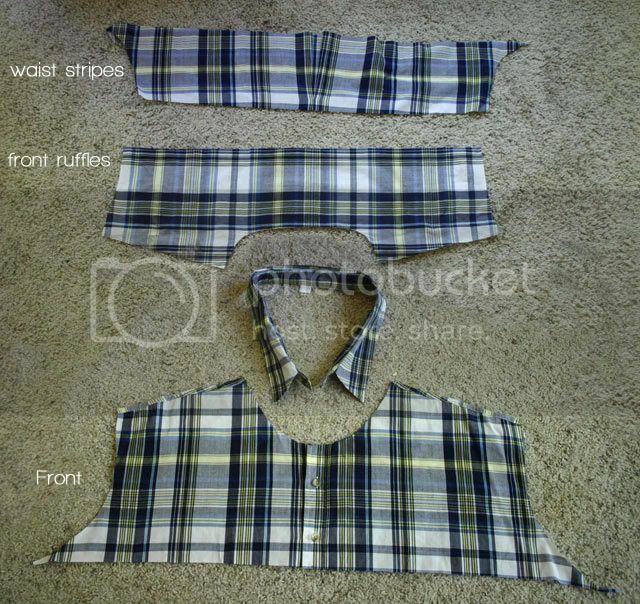 K- Ruffle the back pieces of the shirt and fold and sew the edge to prevent fraying. 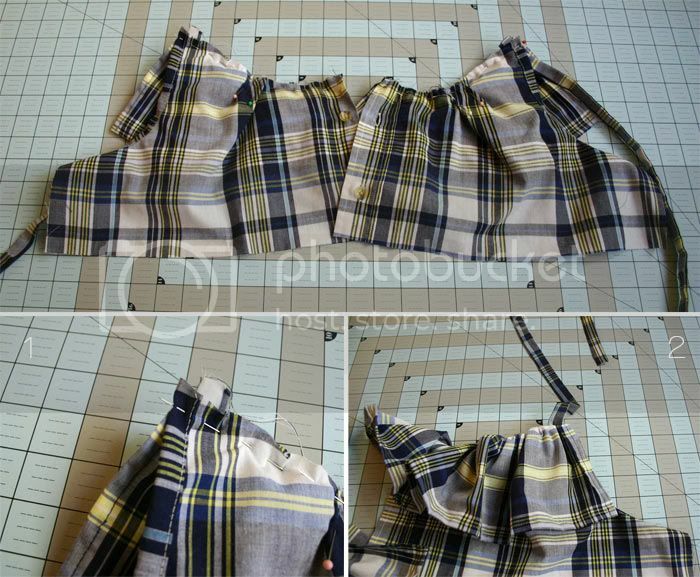 Cut 2 small pieces out of your shirt leftovers to cover the edge under the arms of the front of your dress. L- Protect the edge of the underarm. 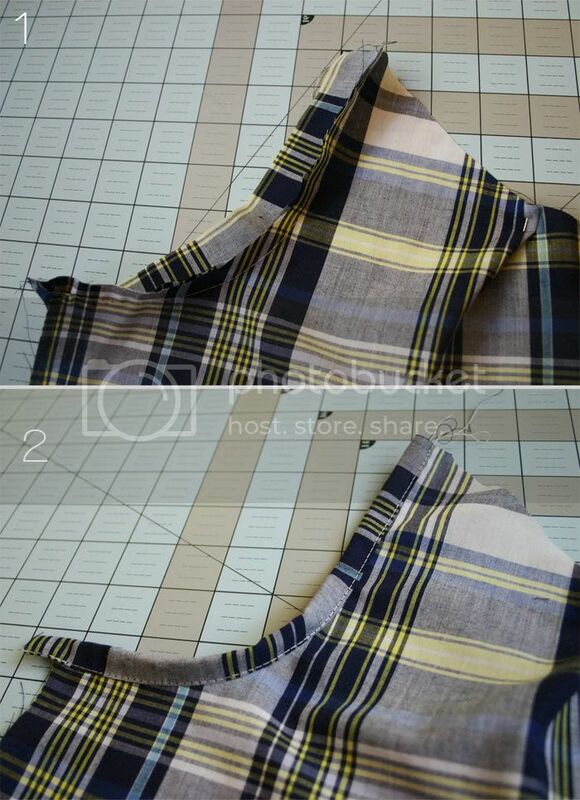 Sew the stripe to the back of your top's arm. Fold and sew on top of the fold for a clean finish. M- Repeat the same process for each side and it should look like this picture. 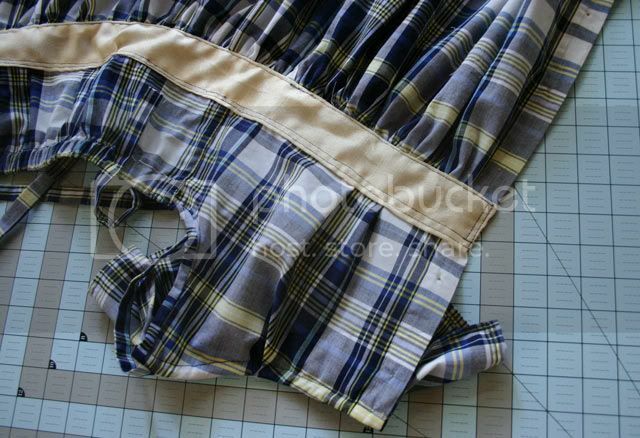 N- Attach the ruffles to the back of the front, with the wrong side facing out. Secure the edge of the straps in between the ruffles and the front. Sew them together. Turn the ruffle to the front. 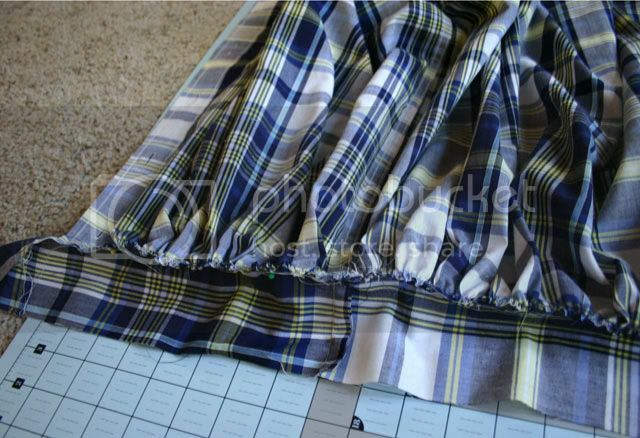 K- Sew the edge of the ruffle to prevent them to fall back. 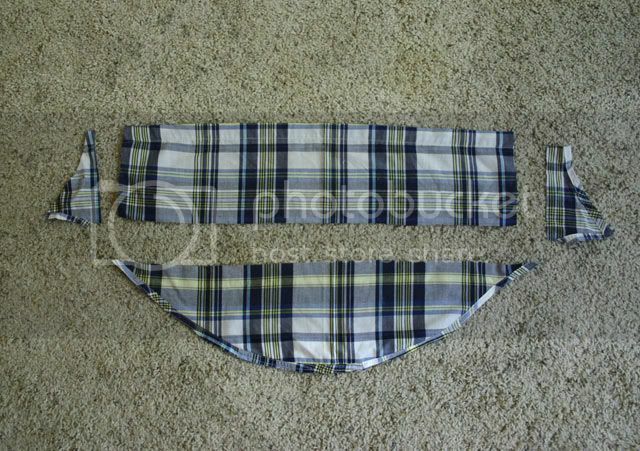 P- Pin and center both pieces together, remember to sew on the dress piece because we will fold the other fabric's waist stripe to cover and make the inside clean. Q- Once everything is centered, sew it. R- Now fold the “other” fabric, and pin to secure it. S- Sew all the way around, I did it double because I like the look. 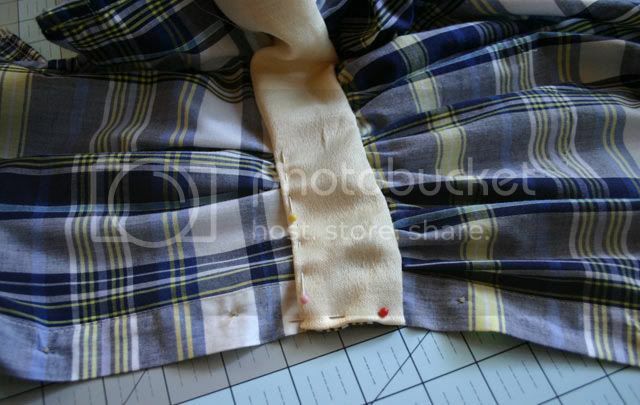 T- Add an extra button hole or pin to the waist so it fits better and doesn't open in that part. I added some lace to the bottom of mine but its just because I love lace! 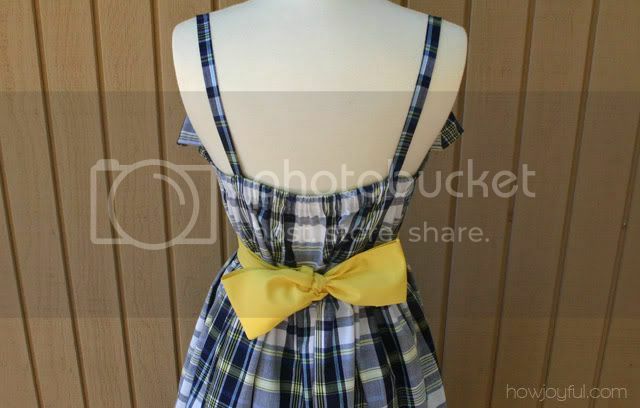 I added a simple yellow sash to my dress to spice it up :) See more pics of this dress HERE. Let me know if you make it I will love to see, Happy Sewing! * This tutorial is provided for personal, non-commercial use only. Check the Site policy at the bottom for further information, Thank you! amazing! my my daughter would love that dress! I suppose there would not be a problem using a smaller shirt to achieve a little less fullness or to fit a smaller girl. I love this! How you worked all that out I do not know..but from now on I am looking for a men’s xl shirt!! Just found your blog and so glad I did! Just found your blog. Wow..you are so talented and creative. It is beautifully made. That came out GORGEOUS! It’s so, so pretty! Thanks tons, I’ll be linking. Wow! What a great idea – and so beautifully executed. I’m going to have to keep my eye out for some men’s shirts. Wow, this is amazing! It’s on my list of projects for August now – thanks so much for sharing! one word. Amazing! I’ve gotto learn technical cutting! Gorgeous! I like your work. I’m wondering if you’ve ever re-fashioned a business shirt for the purpose of keeping it as a wearable business shirt; only a bit more stylish/alternative? I’m very keenly attempting to search ideas on how I might do this. I have all these women’s business shirts – standard, long-sleeve, collared shirts – but I’ve recently shifted to a new industry/job in which I can wear funkier (less corporate) clothing. I don’t want my 10 or so collared business shirts to go to waste. I’m hoping to “style” them up somehow. Would LOVE any ideas or links… thanks! awesome! thanks for the very detailed tutorial. I think this is a lovely dress. It’s remarkable what you’ve done with it! 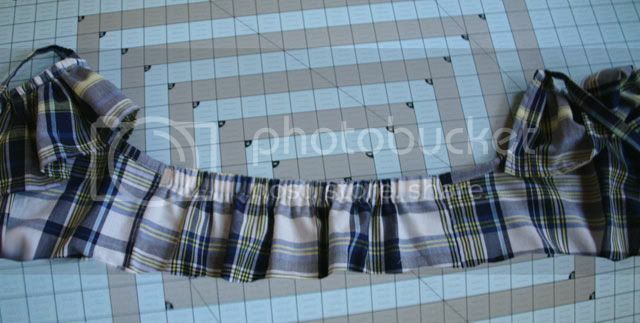 Hi Meghan, yes you will need them to be your waist measurement plus 3 inches (to secure the button at the ends, plus your sewing space), but they are not 3 pieces at the beginning, just 2, each one half the measurement of your waist + 1.5 inch, then to even up the pattern at the back cut one of them and at them at the end and at the beginning. That’s how you get the 3 pieces. Hi eboo, I made this dress for me and I am not sure what size I am in dress but I wear Medium tops. Have a good day! This is so creative. I can’t wait to try it. patterns; you truly are a designer. Keep up the good works. Thanks for sharing. Just featured this on my blog! I will have to try it! 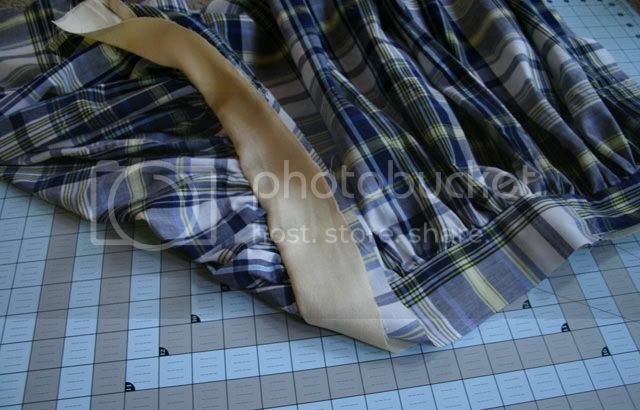 I just made a dress from a men’s dress shirt but yours is definitly inspiring! This is wonderful! It’s on my record of project for August now – thanks so much for distribution! I am so excited to make this! 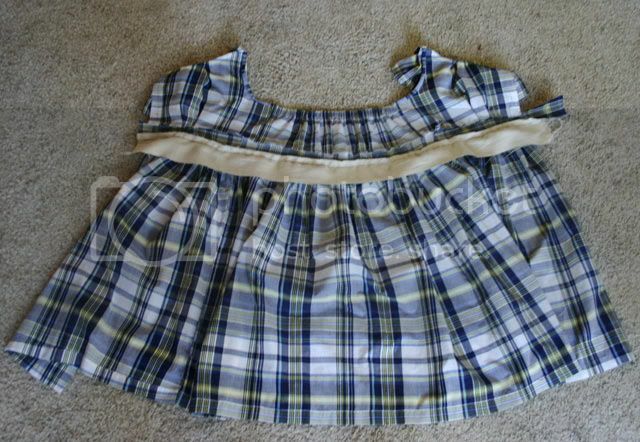 I have a huge shirt but it will make a shirt like this and not really a dress but then I have scrap fabric to make ruffle on the bottom to make it longer. I’ll probably add lace too. THANK YOU! Too bad I cant find a 6XL anywhere! I love your dress and would love to make. I often make tank tops out of t-shirts and have made a few quilts! I am wondering if you can make it without the ruffle at the top as I am not a big ruffle person. Of course! 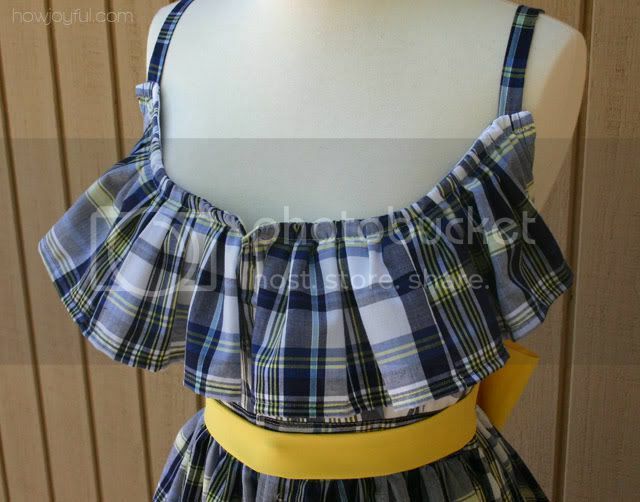 you can make all the alterations you want =] I just made it the way I liked it and felt comfortable, I do love ruffles so that’s why I added the one of the top! I love this pattern!!! 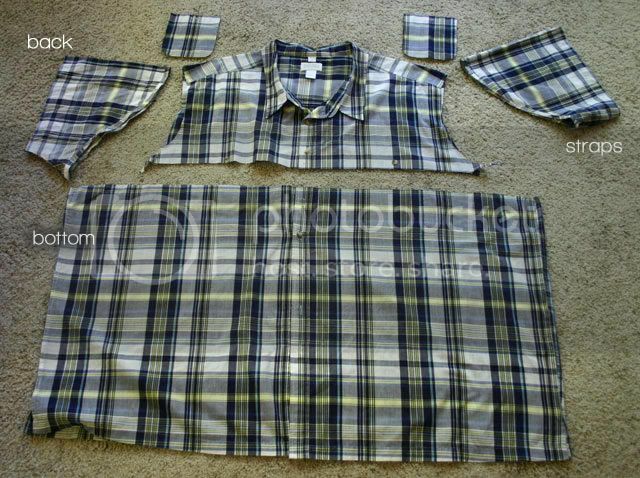 What size would you say it is, because I have a gent’s shirt and a girl I know is a size 6 and wants this done to it, but I don’t know if it’ll work for a men’s size L.
I normally get Medium size dresses but I am 5′ 11″ so I used a 6XL to make sure I had enough material. hope that helps. Beautiful! I love your attention to detail! Thanks for sharing! Fabulous dress which came from a fabulous idea! If a person had more time they could make a lot of these and sell as they are just too adorable, but I haven’t got the time. would like to make one though but it would have to be for my niece after she loses her baby weight (she is 6 months pregnant). she would just love to have an outfit like that after the birth of her baby. Thanks for all your fabulous ideas. Es precioso!!! Me voy a hacer uno así. I love this dress! Definitely something to keep in mind when I get motivated to sew one :) Thanks! Hi! Wow, so an xxxxxx large t shirt. 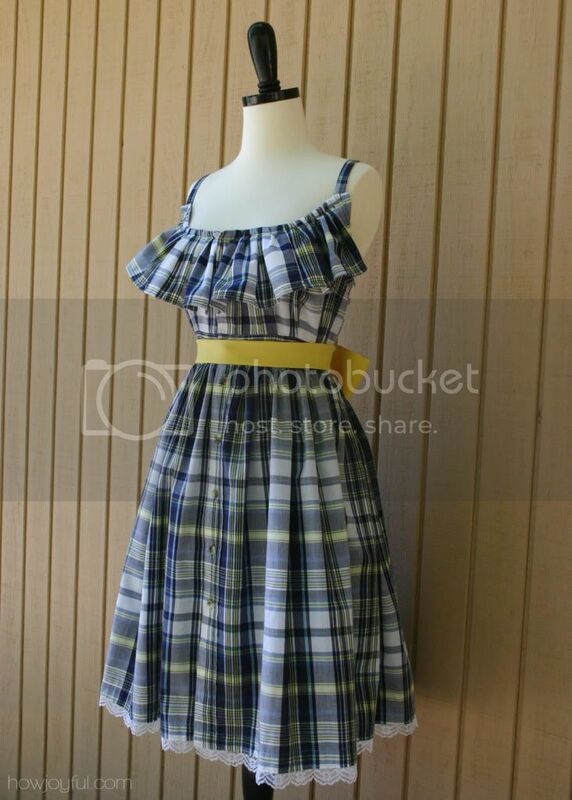 I just love this dress and I saw a similar one on delias.com for about $40! so if making the dress is cheaper, I would make it. But how much does an 6XL shirt cost and where did you get it? Please write back ASAP!! This is awesome! I’m wanting to start to make things for myself, especially dressing. I’m only 5’2 so a shirt this big would probably make a longer dress for me, which is great since I love long skirts/dresses. I’m so glad I found your blog (off pinterest)!! I am 5’2″ as well, I have just started to try to make this dress and it seems to me that it is going to be just about right. 6x shirts are easy to find.. go to burlington coat stores and look the big and tall for clearence items..i did this last year and turned a 3xl shirt in to a coverup for my bathing suit..im a big girl and it was huge on me..love ur blog..
Hey! WOW that’s amazing I’m in the process of making one right now!!!!! I’m kind of stuck on part F! How is the third piece bigger?? I’m sorry I just don’t understand that part! Could you please try to explain to me again?????? Thanks Joy for this fabulous idea. Your tutorial is very clear and easy to follow. 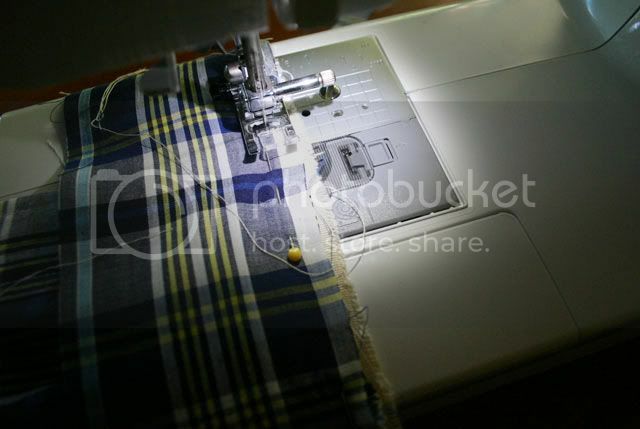 Please submit some more so that people like me can learn to sew. 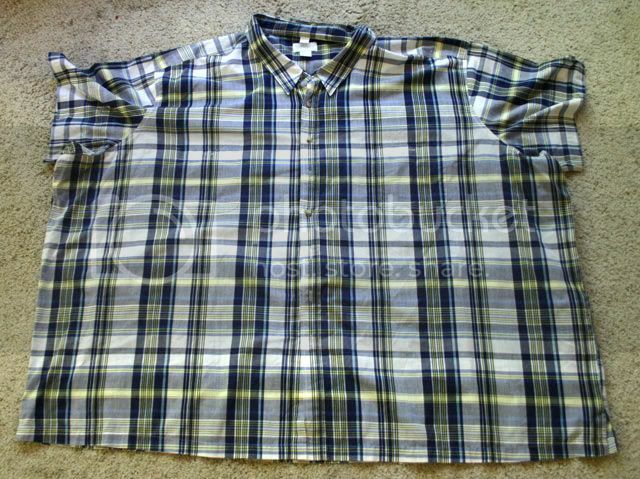 tengo una pregunta : yo tengo talla 14 podre usar una camisa talla XL o XXL ? wow i will try it great work ! You have a great artist in yourself. You have made a really stylish summer dress. Thank you for sharing a very valuable information to us. I will definitely to create for me as i’m not much creative I know it will not look as cool as you had created. I’ll sure update this kind of stuff in my collection soon so you can even earn money for your creativity. Such cute little dress. Thank you for the idea. Gonna make this one of this weekend!